Paris and perfume are as inextricably woven together as Paris and romance. 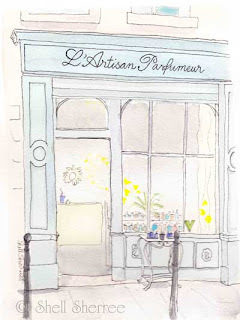 And if you're wafting along the perfume trail in le Marais, you'll happen upon this delicate parfumerie. And if your sensitive nose detects notes of violet nearby, you might be following Virginia. Thanks, dear Virginia, for your kind offer of your photos like this one for inspiration. If you're a lover of Paris, you'll adore Virginia's Paris Through My Lens. She has an artist's eye and the photographic skills to do it justice. Not to mention, she's an all around bundle of fun and smells good! Virginia will love this! I know I do! You never cease to amaze me, Shell. I don't like it a bit.......J'ADORE!!!! Merci beaucoup mille fois mon amie. So nice ! So French ! So YOU !! Here in the USA, Virginia & Alabama are for lovers. so, i only can see paris from your painting! great sherree...I cant wait for more! There's something about your drawing that cries out to be printed on fabric. This would make the most beautiful large wall-hanging, with the softness of the fabric underlining the lightness of touch of the image. What a piece it would make for a dressing-room. What a team. I love this. The combination of your paintings and Virginia's photos make me feel like I've actually experienced a little of Paris. It's much appreciated by this poor girl who can't afford to go for real right now. What a lovely blog she has! Makes me want to hop a plane to paris ASAP. Thank you all, dear petals. I'm glad you're enjoying our collaboration. Happy to help with the Paris daydreams, anytime!! I am reminded of an evening when Jim and I were sipping wine at the bar at Cafe Beajolais in Eagle rock - now, Bistro de La Gare in South Pasadena - when two twenty-something-year-old French guys (waiters) rushed up to me abruply, wanting to know whether I was wearing the perfume they had guessed. They were right. These things can be SO important to the French! OOOOOOOOOOOOOhhhh, it's wonderful! Virginia must smell fantastic! The two of you make a hell of a team, the hiker's right. Off into one of my fantasies: we take over a bateau mouche, all of us. It'll be commandeered by a handsome Frenchman, let's say...Thierry Lhermitte. Do you like him, V? He's for you. And we'll party up and down the Seine for as long as we want to, taking pictures (and painting) and making stops at all the best places (which is everywhere). Now there's an idea; send a beautiful photo of Paris to Shell and she'll turn your image into one of her trademark creations! Bravo Virginia and bravo Shell for creating such a cute and pretty tribute. Mme Benaut, that's a very enterprising idea. Don't you think so, Shell? You could charge the big bucks for that. "Turn your memoree into a Shell Sherree!" Shanna ~ that's a lovely story! "Turn your memoree into a Shell Sherree!" Lol, Petrea. Some of my memorees have been turned into Shell Sherrees. Now the only problem is that instead of vacation photos I want vacation drawings! I just like reading all of these comments. You've all had such fun chatting here. Shell -- you do? Oh, goody! You know how much I loved your versions of my NYC PTDDs. And I am on that bateau mouche, btw. Great idea, Petrea. Alexa ~ hot off the press ~ thank you so very much! !